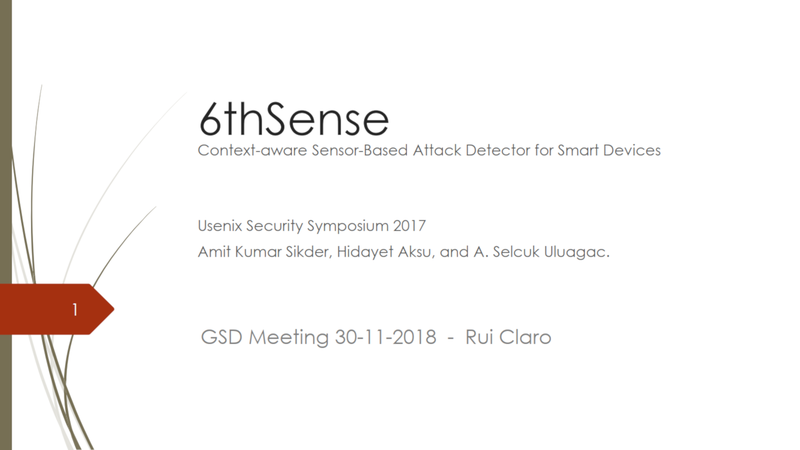 The paper 6thSense: A Context-aware Sensor-based Attack Detector for Smart Devices was presented by Rui Claro at the Distributed Systems Group seminar meeting. The paper by Amit Kumar Sikder, Hidayet Aksu, and A. Selcuk Uluagac from Florida International University, was published at USENIX Security 2017, one of the top security conferences. 6thSense addresses security solutions for IoT devices, namely, it proposes an Intrusion Detection System (IDS). The work tackles the sensor threats in smart devices, by proposing a novel context-aware attack detector. In the scenario where malware is already installed in the smart device, the framework is not able to distinguish between normal and tainted sensor readings. In the original work the Machine Learning training was done offline, so by creating a cloud infrastructure for 6thSense, one could outsource the training step. This raises some privacy concerns in transferring sensor data, but that could be tackled using privacy-preserving techniques.